A seventeen-piece high school orchestra in uniform is lined up on the stage of the Roskilde Hall. Robert Watts enters the stage as conductor, raises his arms and the orchestra gets ready to play. The light is dimmed and eventually extinguished altogether. On a signal from Watts the members of the orchestra set fire to their scores. The scene is briefly lit up by the flames. The duration of the performance equals the time it takes for the scores to burn out, whereupon the room returns to darkness. The light is turned on again; the orchestra bows to the audience and the performance is over. Inside Roskilde Hall, Robert Watts had a fortune teller’s tent erected. Hannah Higgins assisted him as a fortune teller. 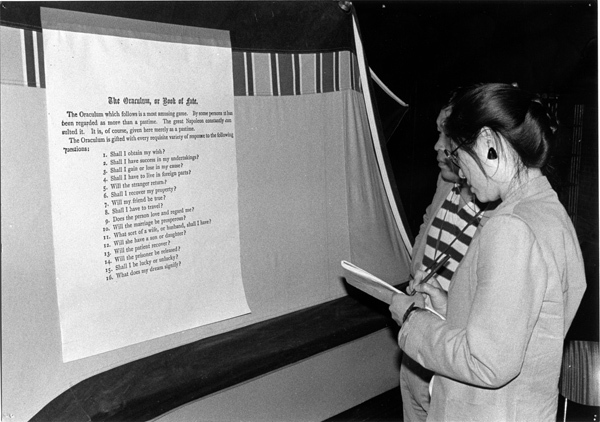 An Apple computer predicted the destinies of members of the audience using the questions below. However, regardless of the supplied information, the destiny would always be the same. The Oraculum, or Book of Fate. 1. Will my wish come true? 2. Will I have success in my undertakings? 3. Will I win or lose my case? 4. Will I have to live in foreign parts? 5. Will the stranger return? 6. Will I recover my property? 7. Will my friend be true? 8. Will I have to travel? 9. Does this person love and respect me? 10. Will the marriage be prosperous? 11. What sort of wife, or husband, will I have? 12. Will she have a son or daughter? 13. Will the patient recover? 14. Will the prisoner be released? 15. Will I be lucky or unlucky? 16. What does my dream signify? Hannah Higgins also performed one of Jackson Mac Low’s Gathas on a guitar, translating all of the letters of the alphabet that appeared in the poem into individual notes numerically. Afterwards, Robert Watts came up and said “I didn’t think I’d like it, but I did”. 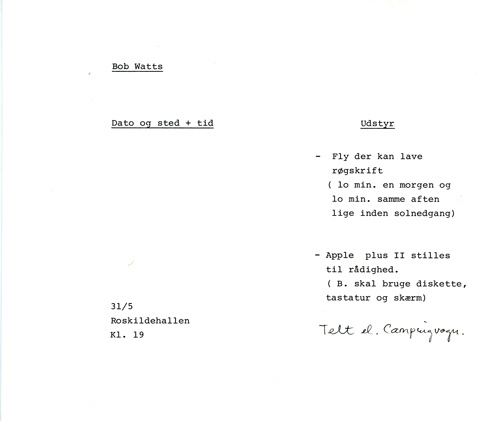 -Arild Batzer: Art makes me sad – from a radio reporters’ diary. On one side of this large sports stadium is a very small stage, onto which 12 members of a local brass band filed in full uniform and began to take out their instruments. A performance of Bob Watt’s “Trace”, done the way he intended it to be and not as Ben Vautier incorporated it into his concert. The curtain went up, the conductor raised his baton and the musicians put a match to the scores in front of them, bow and leave. It was all over in 3 minutes. The purest Fluxus event so far. For the rest of the time people queued up outside a caravan trailer in which a gypsy (Hannah Higgins) instructed them in how to consult an Apple Computer oracle to answer one of a number of set questions concerning their future. One of the most memorable events of the festival was Bob Watts’ performance of his score Trace for Orchestra. 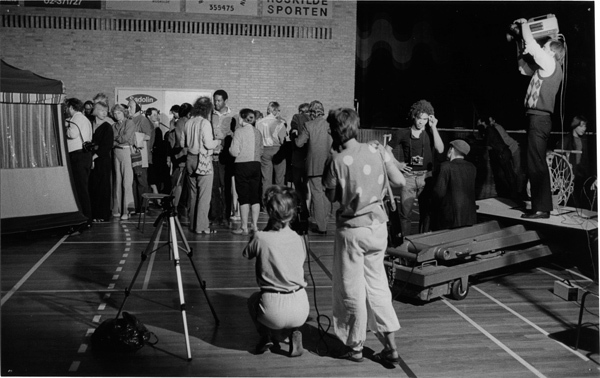 Eric or Marianne had arranged for a group of young musicians, the high school orchestra or band, the performance was in the High School gymnasium/auditorium. The musicians wore their uniforms and Bob was in a gaudy tuxedo. They were lined up across the stage with their instruments and a piece of flash paper for score. The lights went out. The rich red curtain went up and in nearly total darkness Bob with one of those tubes that glow conducted the group. He raised his baton, and as he brought it down the musicians struck matches and lit the flash paper. In an instant it was over and the curtain went down. It was fantastic. Bob had been reluctant to come to Roskilde and I believe Eric and Marianne had to arrange for a first class ticket to get Bob there. He arrived later than the rest of us, but that moment was absolutely worth it. It was so short and so wonderful. While people were gathering for the performance, Hannah Higgins was a gypsy fortuneteller in a caravan there in the gymnasium space performing another work of Bob’s. I remember Bob being a fortuneteller at the Avant Garde Festival in Central Park in 1966.